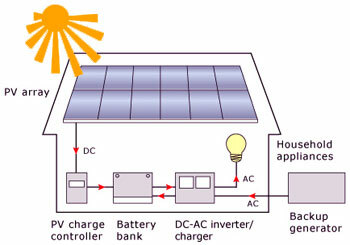 Solar electric, or photovoltaic (PV), systems convert sunlight directly to electricity. They can power an electrical appliance directly, or store solar energy in a battery. An off-grid PV system, commonly referred to as a stand-alone system, is designed to produce electricity for a home, business, or farm, without any supplemental power from the utility or electric distribution grid. An off-grid PV system consist of a PV array, controls, safety equipment, and inverter (to convert DC power to AC), and a battery system or bank to store power. The battery bank is essential because they store electricity that can be used when the sun is not shinning. In some cases, such as a "remote" location that is not close to a power source, a PV system may be more cost-effective than installing power lines and step down transformers in applications such as electrical fencing, lighting, and water pumping. Maintenance requirements are often less for a PV system than, for example, a diesel generator. Successful stand-alone systems generally take advantage of a combination of techniques (maximizing energy efficiency) and technologies (PV combined with a back up generator or PV combined with a wind turbine) to generate reliable power, reduce costs, and minimize inconvenience.